With regards to the petrol and diesel engines, Magneti Marelli has supplied engine control units (2.0 and 3.0 petrol engines), intake manifolds (2.0 petrol and 2.2 diesel engines) and motorised throttles (2.2 diesel engines). 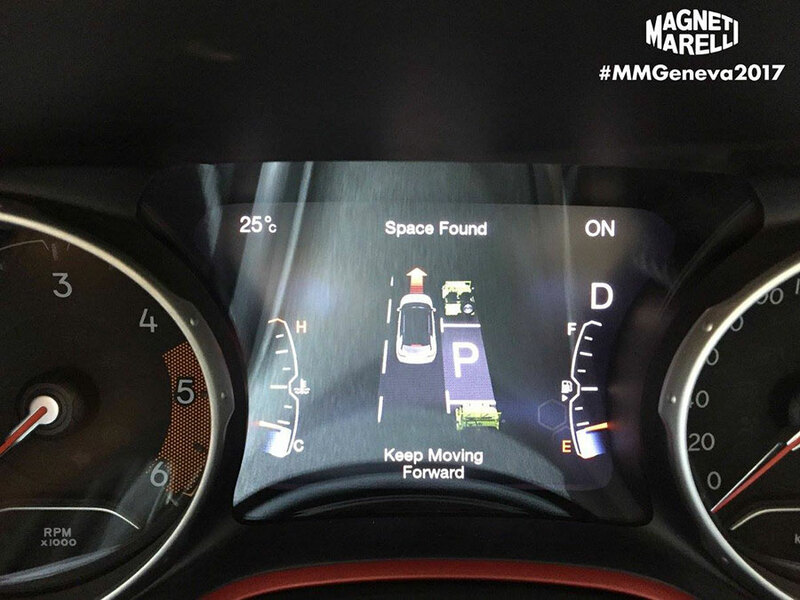 Completing Magneti Marelli’s presence for the Alfa Romeo Stelvio, components for the exhaust system, suspension, plastic components, as well as the CDC – Chassis Domain Control module, available on the Quadrifoglio version: it is the electronic control unit developed by Alfa Romeo and Magneti Marelli that represents the “brain” of the on-board electronics and optimises handling and performance by predictively adopting control and management protocols that coordinate the action of the key systems of the car. The system anticipates and manages critical situations, informing in advance the specific control units involved in the electronic system through the vehicle networks. There are also many super-cars presented at Geneva which have chosen lighting systems by Magneti Marelli Automotive Lighting. Beginning with the Porsche PanameraSport Turismo (three-dimensional LED rear lights linked together with a fine line of LED lights), and including the Audi RS5 (25W Xenon and LED headlights and, in the powertrain area, the motorised throttle). Magneti Marelli lighting systems have also been chosen by Opel for their new Insignia Grand Sport (LED rear lights), Sports Tourer (LED rear lights) and Suzuki Swift (bulb rear lights). The Porsche PanameraSport Turismo has also adopted Magneti Marelli technology in the powertrain area (motorised throttle for the V8 4.0 and V6 3.0 petrol engines). There are also many models which have adopted Magneti Marelli powertrain components, including the CitroënAircross(motorised throttle for the 1.2 petrol engine, ECU Stepper Motor) Seat Ibiza (motorised throttle, ECU for the 1.0 petrol engine and exhaust systems), Skoda Kodiak (motorised throttle for the 1.4 150 HP turbo petrol engine) and the Suzuki Swift which, as well as adopting the intake manifold for the 1.0 petrol engine and the electronic control unit for the 1.3 diesel engine, fits this version with the motorised throttle and the AMT (Automated Manual Transmission) gearbox. Another three finalists for the award also carry Magneti Marelli technology: The Alfa Romeo Giulia (infotainment system with TFT displays up to 8.8” with “black panel” effect and “optical bonding” technology, the CDC – Chassis Domain Control module available on the Quadrifoglio version, halogen and adaptive Xenon headlights, LED rear lights and components for suspension, exhaust systems and powertrain components), the Citroën C3 (motorised throttle for the 1.0 and 1.2 petrol engines), and the Mercedes Benz E class (LED rear lights).